Tonight I thought we would venture out on our usual hack that we have been on quite alot before but not in the past few weeks. We started off with a small tantrum as we were leaving the yard but we soon got over the stubbornness and we were off. And I mean off! In a beautiful elevated trot the kind I have never gotten in the school. The type were your instructor would tell you to sit, enjoy and dont touch a damn thing ! I was seriously surpised with what she was coming out out with! So off we went down the track and round the edge of a field and along the bottom of a second field. We had a short walk in middle but mostly kept trotting. The breaks were on and we were standing dead still. I say we, my mare was standing still and I was still very much moving forward. I lurched forward, I could feel my blood rush to my head and my feet lift towards the back of the saddle. The ground felt very close to my head. Luckly I had hold of a bit of mane so my hands stayed up on the top of her neck. I heaved myself back on as Eva stood glaring at what ever it was that caught her eye. I then kicked on and we continued up the hill in canter. 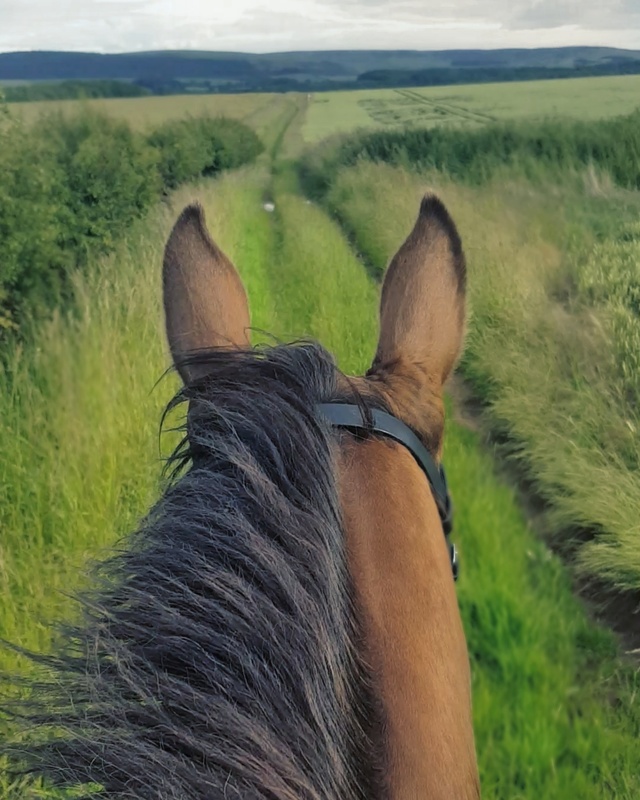 I hate that thing when the brakes go on or they throw in a gleeful buck in the hacking canter and I find myself looking at the ground and wondering how hard it will be if I hit it! The trot work sounds fabulous. What a great way to find out her potential!